This feature was always a favorite on the blog, and I enjoy creating these cards. Previously, I've focused solely on Hall of Fame players who for some inexplicable reason were not afforded a Topps card after their final seasons. For this go round, I'm going to showcase a 1980 Thurman Munson card that should have been printed after his death on August 2, 1979. Munson was 32 years old at the time of his death and was in the midst of his 11th season with the Bronx Bombers. Munson was a fan favorite, first Yankee captain since Lou Gehrig, and was the equivalent of a reinforced concrete wall behind the dish. 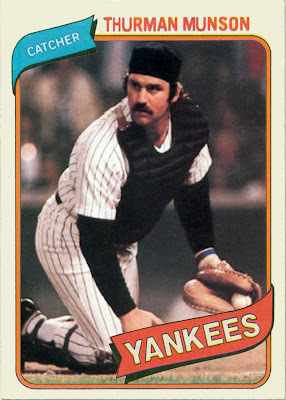 Munson is so well known for his defensive prowess that he appears often as a cameo in other players cards when it features a play at the plate. If you have requests, please leave a comment!